An exact fit for readymade shirts and trousers is always hard to find. There are hundreds of brands but no brand can guarantee a perfect fit. You always have to make a compromise on fit while buying. Somehow, if the fit is good you may not get the colour or size of your choice. Buying formals with a perfect fit has always been a problem for me. I have a slim body and readymade shirts use to look loose from sides which used to give a very bad look. Choice of Colour and Fabric. My waist is 31. I always had to buy 30 or 32 size, 30 were tight and 32 were loose. I have a slim body and readymade trousers always gave an imperfect, tight or loose fit. Each one of us is unique with different body types. The body type varies from slim to healthy. The shirt size or waist size in readymade garments are also fixed. So, its very difficult to find a perfect fit. Recently, I got to know about MYFIT by Van Heusen and ordered a shirt and a trouser. I received my order within 7 days. I could select my Body Type, Fabric and even the sleeve length. I selected body type slim and sleeve length of -1 inch. 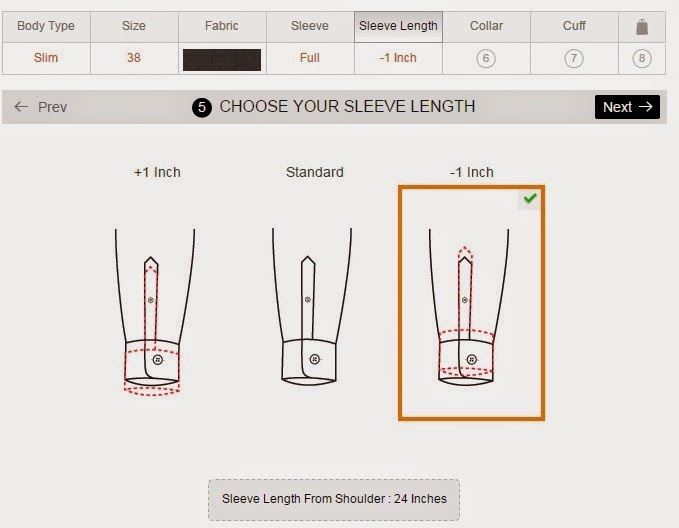 You can select Collar Type and Collar Cuff also. With MYFIT I could choose my body type, fabric and the best part is that I can select my waist size 31. The trouser had a perfect fit and the fabric was awesome.